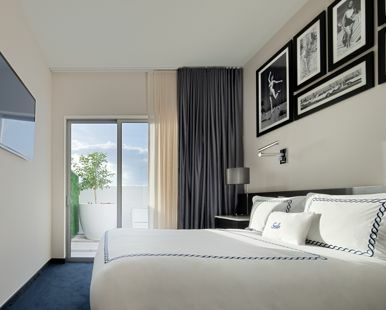 A blend of Tropical Art Deco charm, modern South Beach class and chic Italian notes, guest rooms at the Gale South Beach are modeled with both style and comfort in mind. Our 250 sq. ft. full bed guest rooms are beautifully decorated and includes textured wood accents, ocean-hued carpeting, vintage-inspired furniture, clean lines and sleek décor. Refresh in the bathroom with white marble rain shower and illuminated vanity mirrors, premium bath products and cozy bathrobe. Enjoy complimentary WiFi, a 55-inch HDTV, clock radio with Bluetooth, as well as ample outlets for charging any device. Our 325 sq. ft. King Signature rooms are beautifully decorated and includes textured wood accents, ocean-hued carpeting, vintage-inspired furniture, clean lines and sleek décor. Refresh in the bathroom with white marble rain shower and illuminated vanity mirrors, premium bath products and cozy bathrobe. Enjoy complimentary WiFi, a 55-inch HDTV, clock radio with Bluetooth, as well as ample outlets for charging any device. Our 325 sq. ft. Queen Signature rooms are beautifully decorated and includes textured wood accents, ocean-hued carpeting, vintage-inspired furniture, clean lines and sleek décor. Refresh in the bathroom with white marble rain shower and illuminated vanity mirrors, premium bath products and cozy bathrobe. Enjoy complimentary WiFi, a 55-inch HDTV, clock radio with Bluetooth, as well as ample outlets for charging any device. Our 400 sq. ft. Queen Terrace rooms are beautifully decorated and includes textured wood accents, ocean-hued carpeting, vintage-inspired furniture, clean lines and sleek décor. Refresh in the bathroom with white marble rain shower and illuminated vanity mirrors, premium bath products and cozy bathrobe. Enjoy complimentary WiFi, a 55-inch HDTV, clock radio with Bluetooth, as well as ample outlets for charging any device. Our 350 sq. ft. two Queen Signature rooms are beautifully decorated and includes textured wood accents, ocean-hued carpeting, vintage-inspired furniture, clean lines and sleek décor. Refresh in the bathroom with white marble rain shower and illuminated vanity mirrors, premium bath products and cozy bathrobe. Enjoy complimentary WiFi, a 55-inch HDTV, clock radio with Bluetooth, as well as ample outlets for charging any device. Enter your e-mail address below to receive our exclusive offers & promotions!